"So, the Four Elements have gone plotz-- OMFG LOOKIT THE 8 BIT GRAPHICS! (Only not really; it's iPad retro trying to look 8bit). Prophecy, check, four Warriors of Light, check. Cue cute tinkly Uematsu MIDI music. This is gonna be great..."
Nina: It's an FF game. We gots to have crystals. Rei: Yeah, how much you want for 'em? MOMO: WHY IS MY HEAD BLACK WITH GLOWY JAWA EYES? Rei: I'm a thief, dammit! Let me steal already! Nina: Crystals, Rei. Crystals. If it's like FF3, we'll get skillz when we reach the crystals. MOMO: I DEFINITELY WANT MY GRENADE LAUNCHER BACK KTHX. Rei: WAIT! Don't teleport us back to the #%@ castle! We haven't finished pillaging the dungeon! Nina: Um, that crystal behind you? Momo: Totally looks like ammo for my grenade launcher. Nina: I'm really quite disappointed in that princess. I rescued myself once or twice, you know. Momo: So when am I going to find some magic or jobs or something to REPLACE MY GRENADE LAUNCHER? Rei: Like, if we hold these crystals too long, we'll turn into dragons and destroy the world? Momo: Betcha there's some way to make them explode. Rei: Well, don't that just beat all? Nina: If there's a mouse in this house, I am so out of here. Momo: A cleaner-bot! Now THIS is more like it! Show me the way to the grenade launchers! Rei: *flipping through Tory Peterson Guide to Random Monsters* That's a lizard? Nina: Or a very confused ant. Rei: Cross-dressing pirate babe? Yeaaah! Nina: Alas, that beard looks real. Too bad. Nina: Lvl 2 magic spells. I think we're missing something, folks. Momo: BOOM! BOOOM BOOM CRASH! YEEHAH! Rei: Golly, Peter Jackson Dwarves! Momo: Crossed with Disney, apparently. Laili-ho? Momo: I'm starting to get crossover whiplash. Nina: Don't be silly. We never got around to playing that game. Rei: Oh-ho! Hey, Spoo, go kiss the prince and bag us a big reward! Alas, Spoo's kiss fails to awaken the Prince of the Elves. However, Nina vaguely recollects the King's Chancellor saying that the only person in the entire planet with two clues to rub together is a dancing girl in Cornelia. Accordingly, we sail back to town #1 to ask her for counsel. Rei: And this helps us how? Nina: Plot, Rei. Plot signpost. Momo: Just call her Bradygameguide in a Bikini. Rei: WHAT DID I TELL YOU?! Nina: So that's where to buy the Cure spell I've been wanting for the last two hours. Momo: Fire spell! Thunder spell! BOOM! Tune in next time to discover more plot coupons! When shall we find the Mystic Keys to open all the locked doors I didn't bother screencapping? Will Spoo ever awaken the fair Elf Prince and invite him to tea? ETA: Click here for next chapter of playthrough! This entry was originally posted at http://auronlu.dreamwidth.org/216235.html, where it has comments. This is super cute! I just got an iPad for Christmas and I was tempted to get the remakes of the old FF games for it. 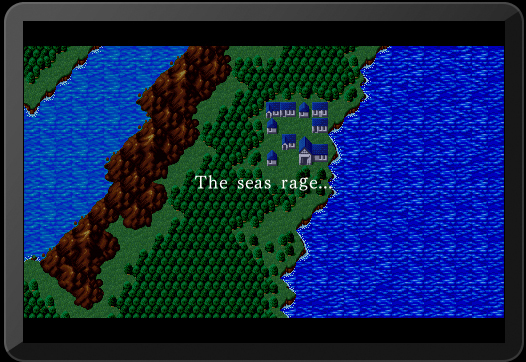 The characters and storylines seemed pretty thin but every once in awhile I want to go back and play a super retro rpg. The shiny new graphics look really great too. I recommend FF3 for iPad. The remake went back and added a touch of backstory and personality to its generic Warriors of Light, the Job system is fun for customization gaming, and the graphics are a cute blend of retro and 3D. FF4 is also available, and lassarina is always telling me that I MUST PLAY IT because apparently it has good characters and plot. Yeah .... that sure is FF1. It came out for the DS - and that's when I got around to play it. ^_^ Fight on! !